Is it arrogant to say that all cultures are not created equal? It might feel that way; but it isn’t that way. To say some cultures are better than others is not only not bigoted, but biblical. The world has taken Christ’s warning in Matthew 7:1 not to “judge lest you be judged” and twisted into an admonition to never make judgments of any kind. But that is relativistic nonsense, as becomes clear when we continue to verse 2: “For in the same way you judge others, you will be judged, and with the measure you use, it will be measured to you.” God isn’t calling on us to withhold from all judgments; his warning is against making arbitrary unfair judgments. We need to be sure we use significant criteria when we make our evaluations – the sort that, were the roles reversed, we would be happy to have used against us. This is also why it is biblical to say some cultures are better or worse than others. When we evaluate them in light of biblical standards we can say with confidence that a culture that threatens death to anyone who converts from Islam is inferior. When it comes to immigration we could still welcome people from such a culture, but only if they are ready to acknowledge the inferiority of this and other aspects of their native culture. I applaud the point that God cares deeply how widows and skeptics are treated. Cultural practices (including the ideology behind them) can certainly be analyzed according to biblical teachings. Is God glorified and his wisdom honored? But attempting to grade entire cultures as better and worse is unedifying. It encourages me to oversimplify or make caricatures. It makes me less comfortable admitting the flaws close to home. The dated example of sati would perplex, horrify and offend most North American Hindus. But they will gladly compare divorce rates with Christians. Are we comfortable discussing European cultural practices around how Christian apostates have been handled throughout the centuries? How much does secularism influence current practices around freedom of belief. Women’s freedoms? What about individualism versus community orientation. Which culture wins then? I highly recommend “Misreading Scripture through Western Eyes” to expand thinking about cultural practices Western Christians take for granted. Do we want to tell another person that killing a convert is an inferior (evolutionarily??) way to live or have a fascinating conversation about submission to a God who laid down His own life for His beloved. Grieve the daughters valued less and the crowds that left churches for racially motivated lynching. Follow the trail of greed’s destruction across time and space. In discussing this article I’m realizing my point was largely missed because I did present an oversimplified argument. As someone noted, India’s culture included widow burning, while the British culture of that time was using force to subjugate and colonize other countries. Both cultures had some serious problems. My intent here wasn’t to present the British culture of that time as being superior in all aspects to the Indian culture of that time, and I should have used more examples to make that clear. What I was trying to speak to – to respond to – is the belief that all cultures are equally valuable. This is a common thought, shared by Christians too, but it is nothing less than relativism. And it is untrue, and harmful. The harm comes in how it fosters a “politically correct” atmosphere that doesn’t allow us to ask or investigate whether immigrants from some cultures might be more problematic than immigrants from other cultures. When all cultures are deemed equally valuable, then that kind of question can be dismissed as offensive and bigoted. But we all know some cultures are better than others. Non-Christian who support the fight against ISIS are tacitly acknowledging this – they recognize this is a culture that needs to be fought, not valued. Our parents understood this during the Cold War. While the West has its sins, the atheistic Communism of the USSR, Cuba, and China was (and is) worse still. And in World War II our grandparents were confronted with the national culture the Nazis had built over the course of the 1930s. It was only through the efforts of millions that this cultures was eventually defeated and dismantled. For the world, evaluating cultural practices is a matter of gut reaction. They have no fixed standards by which to evaluate others. So, sometimes they get it right and they reject, for example, what ISIS offers. But other times they get it wrong, as Canada has in the past year in trying to bring abortion to African nations that have rejected it. As Christians, however, we know what standard to use. A culture is better or worse based on how closely, or not, it aligns with God’s Word. So in this short piece, I was trying to speak against the deliberate blindness we embrace when we say all cultures are equal. 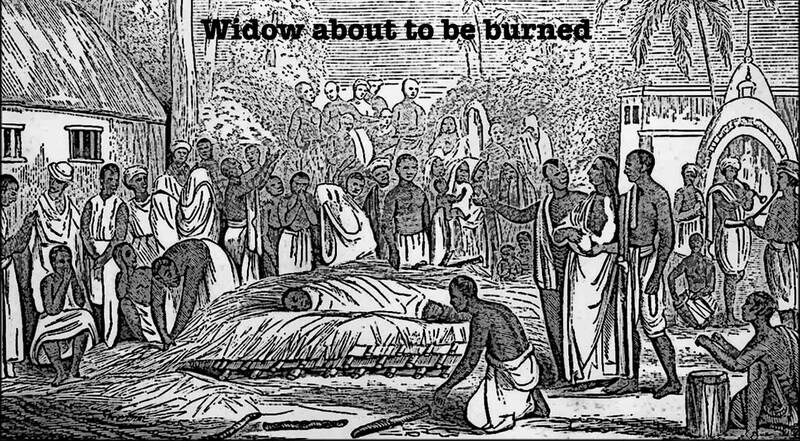 But I see now that the problem with using just the one widow-burning example is that it encouraged a different sort of blindness – the sort where we reject all of Indian culture because in the example it has been deemed inferior and embrace all of British culture because it has been deemed superior. That is not the point I was trying to make. I want us to take the blinders off completely. When we evaluate cultures against God’s Word, then we can see exactly what their strengths and weaknesses are. Then we can praise the West for the many freedoms these democracies offer their citizens, but also decry the millions of unborn they dispose of as trash. Then, even as we recognize all people as being made in the image of God and therefore all being worthy of respect (racism has no place among Christians) we don’t have to pretend that all cultures are worth of this same respect. Then we can discuss and question and evaluate.